"Go, therefore, and make disciples of all nations, baptizing them in the name of the Father, and of the Son, and of the holy Spirit, teaching them to observe all that I have commanded you. And behold, I am with you always, until the end of the age" (Matthew 28:19-20). Before a child is brought to be baptized, we require that the parents be registered members of our parish (or have a letter from their pastor granting his approval that the baptism be performed at this parish) and that they attend our baptism class. The class is held on the first Wednesday of each month at 7:00 PM in the children's chapel of the church. Registration for the class is not necessary, and there is no fee. This class is a prerequisite for parents wanting their infants baptized. 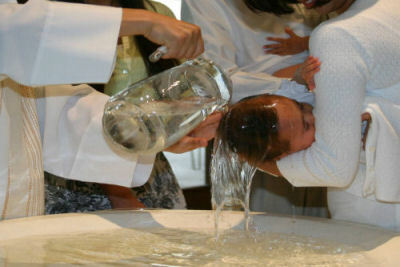 Baptisms at Christ the King are usually celebrated on a Sunday, after the 11:30 AM Mass, but other arrangements may be made. 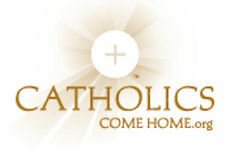 Contact the parish office after taking the class to schedule the baptism. Godparents MUST be married in the Church. They MUST also be practicing, confirmed Catholics.